The first student from the Monash Warwick Alliance to receive their degree in person graduated at the University of Warwick this week. 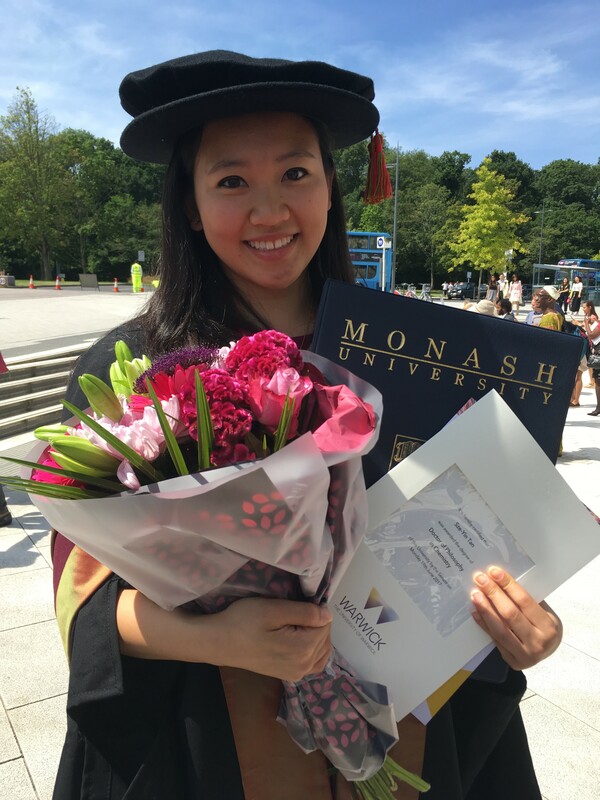 Sze-Yin Tan, who is originally from Kuala Lumpur in Malaysia, was awarded a Doctor of Philosophy in Chemistry – jointly by the University of Warwick and Monash University - at a ceremony on Monday 17 July. She is the first science PhD student from the Alliance to graduate. During her course, Sze was based at the University of Warwick for the first two years, then completed her third year at Monash University - before returning to Warwick to write and finalise her thesis. “I was attracted to the Warwick-Monash program for the opportunity to work at two world-class research laboratories,” Sze-Yin Tan commented. “As I plan to pursue a career in academic research, the Warwick-Monash programme gave me insight, exposure and perspective into the research environments in both Australia and the UK - while allowing me to interact with students and academics from opposite sides of the world. The overall focus of Sze’s thesis research was the measurement of fast electron transfer kinetics and the development of analysis strategies and electrochemical methodologies, which she was able to work on with expertise and facilities from both institutions. This enabled Sze and her colleagues to reveal new aspects and understandings of electron transfer phenomenon, applicable to semi-metallic boron-doped diamond electrode - a material of interest to both the Warwick Electrochemistry and Interfaces Group and the Monash Electrochemistry Group. At Warwick, she worked under the supervision of Professors Pat Unwin and Julie Macpherson in the Department of Chemistry, and at Monash, she studied at the Clayton Campus under supervisors Dr Jie Zhang and Professor Alan Bond. Previous to her PhD course, Sze studied for her MChem in Chemistry at Warwick from 2009-2013 – achieving a first class with honours. Launched in 2012 – and renewed in 2016 - the Monash-Warwick Alliance is a strategic research and teaching partnership between the University of Warwick and Monash University in Australia.